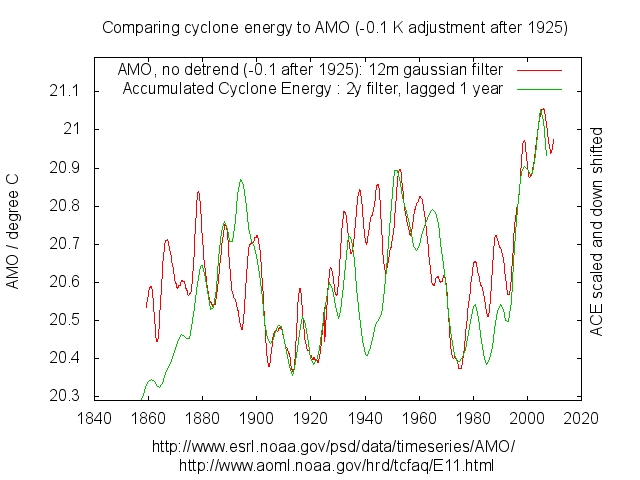 Accumulated cyclone energy is compared to non-detrended N. Atlantic SST (NOAA’s AMO with their ‘trend’ added back in) . There is a striking similarity both in long term and decadal scale variation. There are acknowledged under-counting issues in during WWII and the early part of the ACE record ( Vecchi and Knutson 2011). Though it is not possible to say whether this would reconcile the two in these periods. There is a notable step in SST around 1925 that has been simple subtracted here to emphasise the similarity in the remainder of the record. Whether this is a sampling bias, an over enthusiastic “bias correction” or a real climate phenomenon is not clear but clarification would be valuable whichever the case is. There is very likely significant under counting of tropical cyclones during WWII due to the disrupted and much reduced merchant traffic. The early part of the record is equally considered unreliable. It is also interesting to note that the two records briefly go into anti-phase around 1890 and 1950, in both instances just at the beginning of a major cooling period. A 3-sigma gaussian filter was used with sigma=2years. This will remove most variability below about 3y in period. ACEdata was plotted with a 1y lag. Since the accumulated energy represents the end of year, not the beginning. NB. The non-detrended atlantic SST was used. Similarly a 12mo gaussian was used on the SST data. This is a shorter period low-pass filter but gave a better match in the remaining variability of the two datasets.